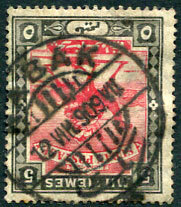 (Studd 110, no illustration in Proud handbook) 3 MAY 1917 on 2p (SG.26) perforated "O S", minor reverse toning. Studd Addendum only records two dated copies for 22 APR 05 and 31 JUL 17. (D2) 12 VIII 09 on 5m (SG.23). 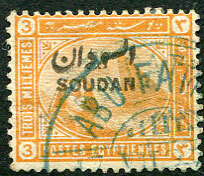 (D1) in blue dated 17 VII 97 on ovp'd 3m orange-yellow (SG.4). Stagg - 2 complete strikes known and some part strikes all on 1st issue. P.O. opened and closed in 1897. Stagg does not refer to cancel in blue. 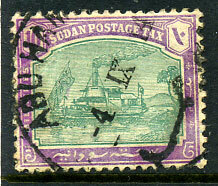 (T.35) in purple dated 20 AUG 1898 on block of eight Egypt ovp'd 1897 5c (SG.5) piece. 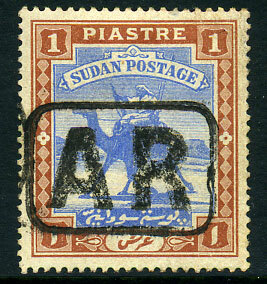 (23x17mm with rounded corners) on 1pi (SG.14). 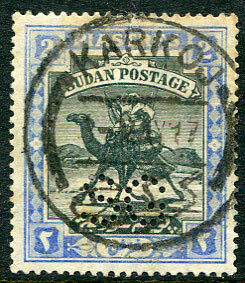 (D2) 6 1 905 on 1p (SG.24). Small perf. faults, extremely scarce. 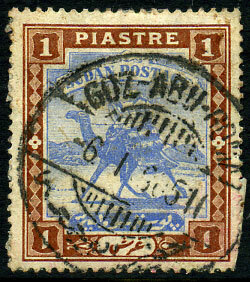 (D4) 4 IX 14 on 10m Postage Due (SG.D7).